Matte makeup really cures oily face syndrome. If your skin tends to get oily very quickly, this type of makeup is for you especially. By applying a matte makeup, you will have a very smooth and fresh look, without any shines on your face that sometimes looks unnatural and gives the impression as if you have been sweating for some time and your makeup is therefore shining. If you belong to the type who is always in motion, then choose this makeup which is ideal for you. Matte makeup is now even trendier than a shiny one. It looks fantastic for day use and for evening as well, whereas shiny makeup seems to be a special one for a certain occasion. Use matte foundations and powder and have a fresh look. To learn tips to apply matte makeup correctly, read the tutorial below. As it has already been mentioned, oily skin needs matte makeup even more than any other skin type. Since your face has a tendency to produce oil during the day, an oil based foundation is a real catastrophe for you. You should stick to oil free foundations. So take a matte one. Always choose high quality mattifying foundations. When you have oily skin, forget about the preparatory step that is normally done for the foundation to be applied. If you use any nourishing creams, your face will produce more oil; therefore you will end up having a shiny face instead. For dry skin types, however, the matte foundation or powder may not have the same effect, since the skin will get even drier. To avoid this small problem, always moisturize your skin prior to applying matte foundation. This is indeed the most important step in the makeup procedure, since the latter provides you with the best base for the rest of the makeup. Use a thin layer of any moisturizing cream, wait till it absorbs and then go ahead to apply the matte foundation. This thin layer of moisturizer will help you get a perfectly sitting foundation. However, be careful with the amount of the powder or foundation, if you do not want to receive a cakey look. To make the matte foundation last longer, you can apply a primer before applying the matte one. You can apply matte foundation with a foundation brush, or with your fingers. Apply a bit of foundation on your cheeks, chin, and nose, and then blend carefully with downward motions. The same way apply it on your forehead, blending upwards toward the hair line. If you have a normal skin type, then you can use the moisturizer in some zones only. Since you want the matte foundation to look flawless, prepare a matching base for it. Apply a moisturizing cream on the t-zone only. Especially when your entire face seems to be ok, but you have an oily nose, make sure to apply a mattifying primer as well, so that the latter does not spoil your look throughout the day. Once you have applied the moisturizing cream and a primer, you can apply concealer as well, in case there are any areas on your face that need to be worked on. Apply it under your eyes and correct the imperfections you may be facing. Take matte eye shadows and apply them gently on your eyes. Feel free to use both eyeliner and mascara to have highlighted eyes. Now you can think about applying a blush. Take earthy colors and apply the blush with a wide brush on your cheekbones, defining them correctly, on your nose and a little on your forehead. Once you complete this part you can pass on to your lips. Lips should be prepared for the lipstick. 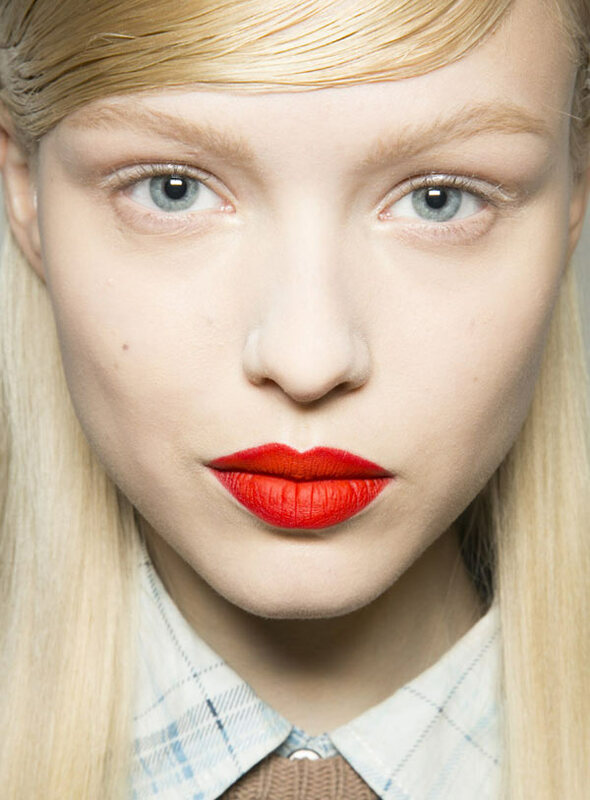 Never apply a lipstick on bare lips; you will have an unsmooth look, besides the latter will not last long. As it has been tracked by makeup artists hundreds of times, you lips need a special care. Since the skin on the lips is very sensitive, it easily gets dry and cracked. So in order to make the lipstick appear on an even surface, make sure to care about the lips first. Use scrubs to moisturize your lips and get rid of the dead skin that looks so ugly when covered with a lipstick. To let the latter get nourishing, apply a lip balm and let it absorb. Now that you have a smooth base, use a little powder to make the lipstick last long. Take a liner of the same color or a shade darker as your lipstick and draw a contour. Now it is time to use the matte lipstick. Apply the latter carefully, preferably with a thin brush, starting from the center of your lips. Use a tissue to get rid of the excess lipstick and avoid any shining effect. There is nothing difficult or impossible in makeup application; simply every nuance should be taken into consideration to avoid crucial mistakes. Keep in mind these easy beauty tips and have a smooth matte makeup both for day use and evening looks.